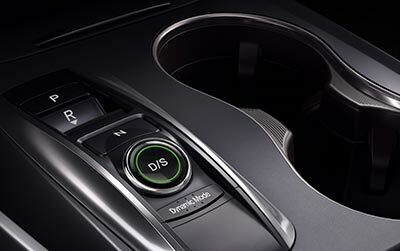 MDX features our innovative three-motor Sport Hybrid SH-AWD powertrain. Rear motors work independently to enhance handling in curves with torque vectoring. SH-AWD is continuously active, designed to enhance high-performance dry-road handling while providing the same all-weather advantages of conventional all-wheel drive. 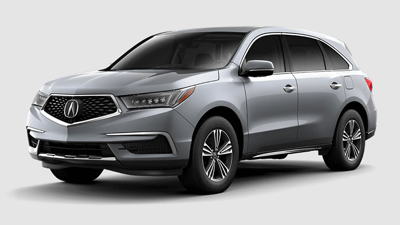 The light-weight MDX front-wheel drive platform, increases fuel efficiency and decreases starting price – perfectly fitting if you live where the weather is generally agreeable. The first line of defense in collision safety is in the structure of the car itself. Our Advanced Compatibility Engineering body construction is integrated into every Acura model, including the MDX, to help reduce and disperse forces in front crashes. With the flexibility of 60/40 split second-row and 50/50 split third-row seatbacks, MDX adapts to a variety of passenger and cargo combinations. Behind the third-row lies over 15 cubic feet. Fold the second-row for over 90 cubic feet of pure storage bliss. 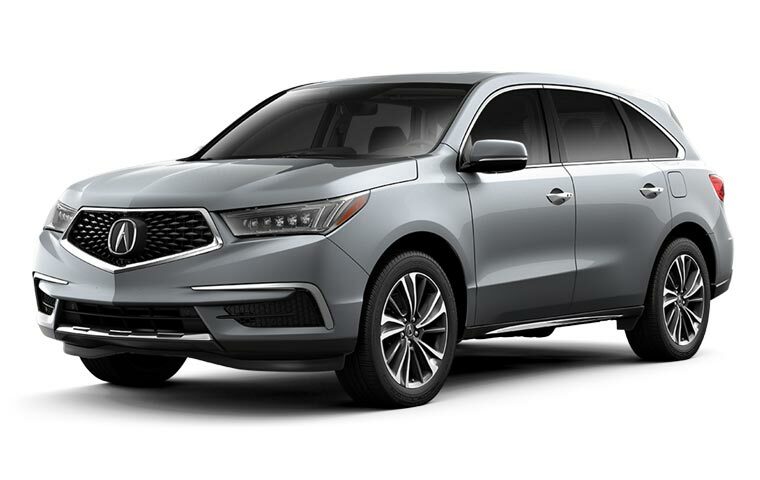 The new face of Acura makes its production model debut here and now. 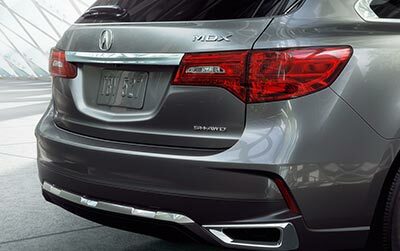 A centerpiece of this redesigned MDX is the signature diamond pentagon grille. It previewed in Detroit on the Acura Precision Concept, and now, it’s ready for the road. 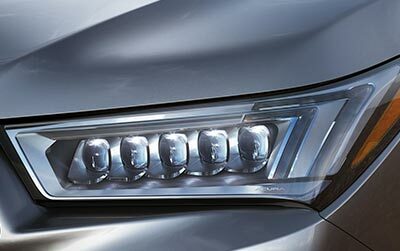 The Jewel Eye LED headlights carve out their own space in the MDX profile. 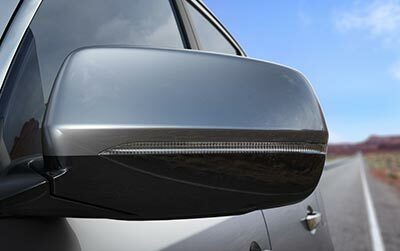 Brighter, whiter and longer-lasting than traditional headlights, casting a precisely focused beam far into the future. 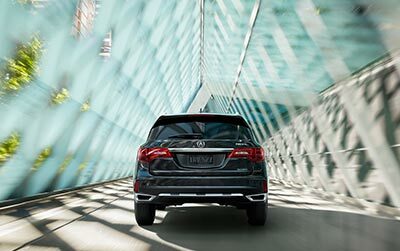 The stunning dual exhaust pipes of the reimagined MDX embody the spirit of Precision Crafted Performance. Each is outlined in chrome for a lasting statement. 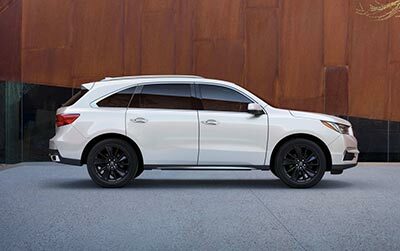 As aggressive as they are appealing, the optional 20-inch alloy wheels of the MDX were designed to leave a lasting impression from the very first glance. 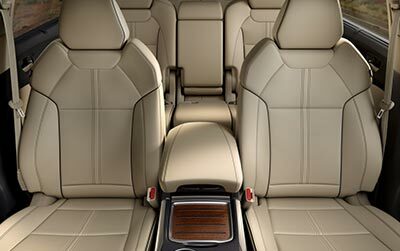 Space for all your accoutrements, the center console armrest slides forward and backward for your comfort. Inside is a small bin perfect for phone and personal items as well as a lower door with non-skid ribs on its surface for a purse or electronic device. Leading the way in audio and information technology has its advantages, and its challenges. As the number of features continued to increase, Acura designers foresaw a very crowded center panel. So they designed an intuitive touch screen called On Demand Multi-Use Display (ODMD) to house all the controls you need at any given time. As a result, what could have been more than 41 buttons has been simplified to nine. Designed for both drivers in the family. Set your personal seat positioning preference once. Then, when you step up to your MDX with your personal key fob, the driver’s seat will instantly adjust to your selected settings. Handheld texting while driving is illegal in most states and highly dangerous in all. The integrated SMS text message and email function enables you to respond to incoming text messages while following the law and helping minimize the potential for driver distraction. Drivers with paired, Siri-equipped iPhones can also use voice-command to perform these (and other) functions. When driving with a paired, activated, SMS-compatible phone, the system will notify you of an incoming text message. The sophisticated interior lines of MDX Advance models are trimmed with handcrafted wood, giving you the ultimate sense of sharpened refinement. Options include a West African sourced Black Limba or an Olive Ash Burl originating from Spain. 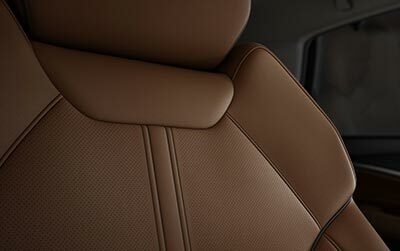 The exclusive styling of the leather seats reflects our dedication to craftsmanship and comes standard in every MDX. 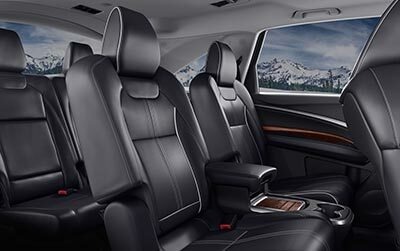 Each seat is designed with ergonomics in mind, so both drivers and passengers feel a secure and comfortable connection to the road. Bring in the day – and night – with a broad sky view. The power moonroof has the option to recess fully or open to a tilt. Smart one touch opening and closing automatically reverses if an obstruction is detected. Tinted glass helps to manage glare and heat. Personal preference should never be limited to just one passenger. 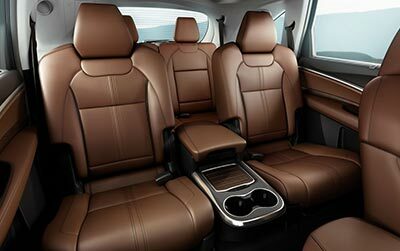 That’s why the MDX has three fully adjustable climate zones. Add the Technology Package and temperatures can automatically adjust to the exact angle of the sun’s rays. The MDX heated steering wheel, available with our Advance Package, warms your hands and fingers when the weather turns cold. With just the push of a button, chilly mornings quickly become much more agreeable. To help reduce the likelihood or severity of a frontal impact, the Collision Mitigation Braking System (CMBS) uses both a radar system and a high-resolution forward camera to recognize hazards such as vehicles or a pedestrian. The system can use up to 80% of full braking power to avoid or reduce impact with the detected object. Setting the cruise control during your urban commute? Acura technology makes it possible. As with a conventional system, the available Adaptive Cruise Control (ACC) with low-speed follow system allows you to set a desired speed but also maintain a desired interval from the car ahead so you enjoy the benefits of cruise control in light traffic. The Lane Keeping Assist System (LKAS) uses a camera50 that can identify lane divisions and works proactively to keep the vehicle within a detected lane. To help your MDX stay on the road, the Road Departure Mitigation System uses a monocular camera to recognize roadways and solid lane lines. 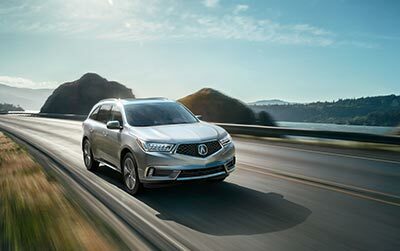 If the system detects that the MDX has drifted over road markings it will provide alerts, steering assist and if necessary, braking assist. The Vehicle Stability Assist (VSA) system uses an array of sensors, along with ABS, and on models so equipped, Super Handling All-Wheel Drive (SH-AWD], to reduce the dangers of oversteer or understeer. 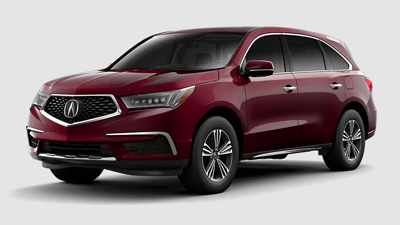 If the MDX detects a vehicle in the next lane’s alert zone while going over 20 MPH, an indicator appears on the side mirror. If you signal in the direction of that vehicle, the mirror indicator flashes and a warning beep sounds. Giving drivers the ability to see even more, the new Surround View Camera system delivers an unparalleled vantage point while parking. Four cameras ingeniously positioned around the vehicle assist in uncovering blind spots as well as potential obstacles. Pulling in or reversing out, you’ll experience a heightened sense of your surroundings. Our innovative parking sensors detect when the MDX is getting close to an object or surface with a series of beeps you can hear in the cabin. The beep sounds more rapidly as you get closer. Designed to have your back when you need it most. The Rear Cross Traffic Monitor alerts reversing drivers if another vehicle is approaching from either side. You’ll find it especially helpful when backing out onto a busy street or parking lot. Prices shown are Acura suggested retail prices only and do not include taxes, license or destination and handling charge. Destination & Handling charge is $995 for sedans and $995 for SUVs. Acura vehicle accessory costs, labor and installation vary. Dealers set their own prices. Please consult your selected dealer. Based on 2017 EPA mileage ratings. Use for comparison purposes only. Your actual mileage will vary, depending on how you drive and maintain your vehicle, driving conditions, battery pack age/condition (hybrid only) and other factors. Does not apply to fluid and filter changes or periodic inspections. Please refer to the maintenance section of your owner’s manual to determine all appropriate maintenance intervals. SiriusXM Satellite Radio, subscription purchasable after trial period. If you decide to continue your service at the end of your trial subscription, the plan you choose will automatically renew and bill at then-current rates until you call 1-866-635-2349 to cancel. See SiriusXM Customer Agreement for complete terms at siriusxm.com. Other fees and taxes will apply. All fees and programming subject to change. Not all vehicles are capable of receiving all services offered by SiriusXM. Current information and features may not be available in all locations, or on all receivers. XM satellite service is available only to those at least 18 years of age in the 48 contiguous USA and DC. SiriusXM Internet Radio service is available throughout our satellite service area and in AK, HI and PR. © 2015 Sirius XM Radio Inc. Sirius, XM and all related marks and logos are trademarks of Sirius XM Radio Inc.  Windows Media® Audio is a trademark or registered trademark of Microsoft® Corporation in the United States and/or other countries. The USB Audio Interface is used for direct connection to and control of some current digital audio players and other USB devices that contain MP3, WMA or AAC music files. Some USB devices with security software and digital rights-protected files may not work. 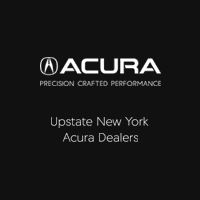 Please see your local Acura dealer for details on compatibility. Currently includes fifth generation or later Apple iPod, and all generations of iPod Nano, iPod Classic, iPod Touch, or iPhone®. iPod® and iPhone® are registered trademarks of Apple Computer, Inc., registered in the U.S. and other countries. Acura Navigation System and related features available only in the United States, Puerto Rico and parts of Canada. 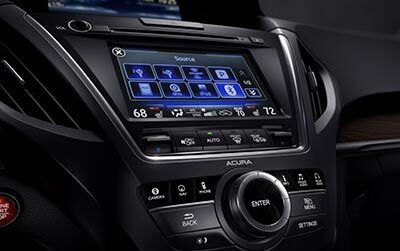 See your local Acura dealer for information regarding navigation system area coverage. The Bluetooth® word mark and logos are owned by the Bluetooth SIG, Inc., and any use of such marks is under license. VSA is not a substitute for safe driving. It cannot correct the vehicle’s course in every situation or compensate for reckless driving. Control of the vehicle always remains with the driver. Ordinary maintenance items or adjustments, parts subject to normal wear and replacement, and certain other items are excluded. When installed at the time of new-vehicle delivery. See your local dealer for details about Total Luxury Care® (TLC), Roadside Assistance, and Concierge Service. Some models require premium fuel and for others, it’s recommended. Consult your dealer for details. The system is not a substitute for your own visual assessment before changing lanes; system accuracy will vary based on weather, size of object and speed. ELS Surround® and ELS Studio® are registered trademarks of Panasonic Corporation of North America. All rights reserved. Compatible with select phones with Bluetooth® only. Your wireless carrier’s rate plans apply. State or local laws may limit use of texting feature. Only use texting feature when conditions allow you to do so safely. Drive responsibly. Some state laws prohibit the operation of handheld electronic devices while operating a vehicle. For safety reasons, always launch your audio application or perform any other operation on your phone or audio device only when the vehicle is safely parked. Compatible with select smartphones. Your wireless carrier’s rate plans apply. Based on SAE J1100 cargo volume measurement standard. Based on SAE J1100 cargo volume measurement standard plus floor space between first and second seats and front seats moved forward. This figure compares more accurately with most competitive measurements. Always visually confirm that it is safe to drive before backing up; the rear view camera display does not provide complete information about all conditions and objects at the rear of your vehicle. Adaptive Cruise Control (ACC) with Low-Speed Follow cannot detect all objects ahead and may not detect a given object; accuracy will vary based on weather, speed and other factors. ACC should not be used in heavy traffic, poor weather or on winding roads. The driver remains responsible for avoiding a collision. AcuraLink Real-Time Traffic is operable only in select markets within the 48 contiguous United States, as well as Vancouver, Toronto and Montreal. The service is available at no cost for three years after purchase whereupon it will continue to be available on a subscription basis. LKAS (Lane Keeping Assist System) only operates when lane drift is detected without a turn signal in use. LKAS may not detect all lane markings or lane departures; accuracy will vary based on weather, speed and road condition. System operation affected by extreme interior heat. Driver remains responsible for safely operating vehicle and avoiding collisions. Horsepower includes the maximum power of the engine and all motors combined that can be produced at any one time. Not SAE net. Credit card and AcuraLink The Next Generation enrollment required to sign up for 90-Day Free Trial of AcuraLink Premium. For owners with Standard package enrollment, credit card will be billed for 1-year Premium package subscription if 90-Day Free Trial not cancelled by day 90. For owners with Connect package enrollment, credit card will be immediately billed for 1-year Connect package subscription, and the difference between the 1-year Connect and Premium packages will be charged if 90-Day Free Trial not cancelled by day 90. For owners with Premium package enrollment, credit card will be immediately billed for 1-year Premium package subscription. If you cancel by day 90, you will be refunded the Premium package subscription fee. If you do not cancel, your 1-year AcuraLink Premium subscription begins – giving you 15 months for the price of 12.